I was making Harry a sandwich for lunch today and, as we didn’t have much in the pantry (note to self: get yourself to the shops woman! ), I asked him to choose between Vegemite or peanut butter and this is what happened each time I asked him to choose. This got me thinking back to a PODD workshop (the communication system that Harry uses) I did with Gayle Porter, who also created the PODD, and a major AHA moment for me. In that one moment months of ‘behaviour’ from Harry a few years prior made perfectly painful sense. As I now know, in the words of Jane Farrall, “behaviour isn’t a barrier to communication, behaviour IS communication”, but at the time I didn’t completely understand this. I can tell you right now if someone asked me if I wanted to for a swing or go swimming, when in fact I fancied myself elbow deep in OPI nail polish whilst sipping on a pinot, chances are high I’d be pretty annoyed at the two choices in front of me. And even more so if I had no other way to tell you that I wanted option C.
Harry had initially responded well to choice making using symbols printed onto cards or PECS (Picture Exchange Communication System) but in the months prior to us introducing the PODD to him, he would rip the cards off the board and throw them around the room. Or he wouldn’t look at them and just point to whichever card was closest. So we’d test him (I know, I know) to make sure that he actually understood what the cards represented and change the order of the cards he had just chosen from. Again he would choose the one closest which we took as evidence that he was not ready for a robust communication system like the PODD. 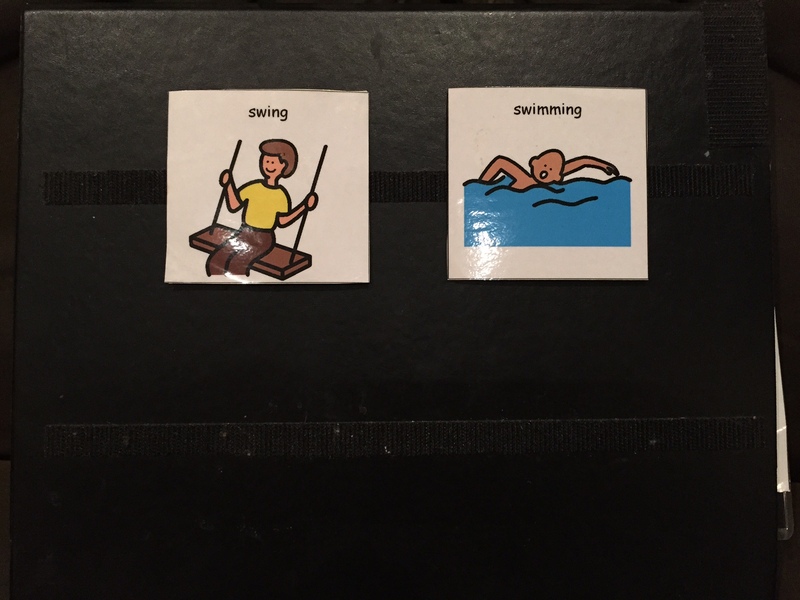 During Harry’s initial stage of recovery after his brain injury, using symbols on cards was a great way to introduce him to the concept that these symbols had meaning and he could use them to communicate with us. At that stage we had no idea how his recovery would go and what his capacity to learn and communicate would be, especially after some rather devastating news from a rogue neuro-psychologist (a post for another time). But I do believe that simple choice making in whatever form it takes does not represent the kind of robust communication system that every person has a right to. And that really is the crux of it – we didn’t know what he was capable of and for that very reason our resposibility to him and to every person with complex communication needs is to presume competence and give the boy a chance because the alternative, well, I can’t even imagine. *Gayle’s actual 2 choices she gave in the workshop were ducks or swimming, I think, but you get the gist. Great post! My daughter, Lucy, has Rett Syndrome and uses the PODD book and Grid2 software with PODD on her Tobii with eye gaze. I write about a lot of the same topics and I loved reading a like-minded person also trying to get the world to understand what our children with complex communication needs have a right to. P.S. Lucy loves pancakes with cream cheese also! Thank you! Looking forward to having a read through your blog. It’s lovely to hear from a like-minded mum of a fellow PODD user. Ha, love that Lucy also has quirky tastes – Harry hates maple syrup on pancakes, which I always assumed anyone would love.